But alas, things are good around here and I’m the last person who has anything legitimate to complain about. After a 6-month hiatus of no weekend trips or travel (with each other), Greg and I loaded up the ol’ Honda Element and headed over to Santa Cruz for an overnight. We stayed in the dog-friendly bungalow at a quaint B&B and enjoyed everything the coast has to offer. Booze and snacks to be sure, but also much-needed sun and sand. I can’t wait to show and tell you everything that we have going on. I know I say this a lot, but you should expect to hear more from me this year. Seriously. We have so much going on. We headed north over the Golden Gate Bridge for the holiday weekend; Greg took Friday off, so we got a head start. Heading to the Russian River was my idea. I was chasing the sun and 80*F temps, along with water that is very swimmable this early in the season. Thankfully the forecast was accurate! We stopped at the Fishetarian in Bodega Bay for a lunch of fish tacos and beer. It was chilly on the coast, so we quickly made our way inland to Monte Rio. It’s a little sleepier than Guerneville and there is a shady parking spot adjacent to the dog beach. Perfect! Miles swam around with his ball during cocktail hour while we contemplated how to spend the next 3 days. The real adventures began on Saturday. Greg and I went for our respective long runs (7.5 miles for me, 10 for him) and then we started scheming the best way to kayak the river. For all of Greg’s planning efforts, things could not have gone worse. We drove 3 miles out to Duncans Mills to drop a bike there. That’s where we’d take the boat out of the water. I volunteered to ride my bike back to collect the van, which we would be leaving 7 miles upriver in Guerneville. At Johnson’s Beach, we loaded the boat with our phones, my cycling shoes, booze, and snacks and set off down the river. The three of us (me, Greg, Miles) were in the inflatable kayak, which made it very difficult to steer. Greg also forgot one of the seats, so he was leaning against a lifejacket in the back. These two things alone made for a long trip. What literally made the trip long is that the current in the Russian River is about as strong as that on a lake (read: almost imperceptible). So instead of just floating happily with the current, we were actually having to do a lot of paddling. I’d happily paddle, but Greg was having to work so much harder to steer the boat when I paddled that it was better for me not to (other than when we were paddling into a strong headwind, which was often). We thought we’d be able to average 3 mph or so down the river, but we were only averaging 1.5 mph. A booze cruise that should have taken no more than a couple of hours took over four and ended up being a lot of work. On the upside, Miles had fun! 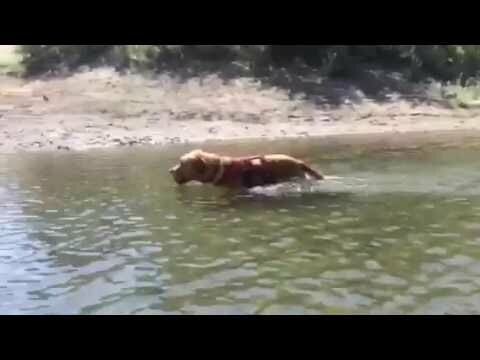 We would throw his ball and he’d dive off the kayak to fetch it, then swim alongside the boat until he could walk on an island to rest for a minute. We got good at lifting him into the boat using the handle on his Ruffwear harness. He’s such a good adventure dog! We were thinking we’d be able to pull off onto islands to stretch our legs and hang out, but we were running out of time. We didn’t get started until 2 PM and we had a small issue at the end of the line. This is where Greg’s planning skills really fell apart. You know, details like where we’d be able to pull the boat out of the water in Duncans Mills. He thought he saw a place on the map. He assumed there would be a trail. He guessed no one would be around to see us hauling a kayak and gear out of the water into town. Well, there were people at the place he thought he saw and they said it was a private beach (maybe). The other place he had in mind was farther away than he thought it was. The one place he did find wasn’t really a trail at all, which would mean we’d need to bushwhack our way up the hill and into town. I was OVER IT by this point (as we all were), but there was no choice but to go with this plan. It was treacherous and awful. I was wearing a bikini and flip flops, having taken my river shoes out of the van during ski season and not remembering to put them back. There was poison oak and thistles everywhere. At one point, I made Greg stop so I could take a picture to document the desperate situation. Of course, once we got the boat into town, I had to get on my bike and ride 7 miles back to Guerneville. FML. The sun was behind the mountains by the time I got back to Duncans Mills at 7 PM, and the breeze blowing off the ocean was cold. Greg and Miles were wet and freezing by the time I rescued them, and Greg still had to break down the kayak. We slept well that night and woke up sore. Three days post-adventure, spots of poison oak rash started showing up on my legs and torso. And my face. My chin and lips are covered in oozing sores. I got a steroid shot this morning and am on my way to the pharmacy for cream now. What a delightful souvenir from our trip! It was three short years ago that Greg and I turned our eyesore of a backyard into something beautiful and sustainable. Remember this? I am happy to report that this lawn has lived up to all of its promises and looks as beautiful today as it did three years ago. We spent a little time this weekend filling in around the flagstone and re-mulching everything. We got the sprinklers working again so that the plants don’t die when we leave on long weekends. I love my low-maintenance yard!